Advancements in genomics are opening new doors for understanding human diseases, and they are increasingly informing innovative precision treatment plans. 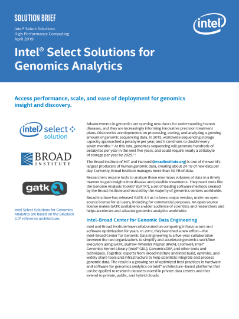 Discoveries are dependent on processing, storing, and analyzing a growing amount of genomic sequencing data. The Broad Institute of MIT and Harvard is one of the world’s largest producers of human genomic data, creating about 24 TB of new data ...per day. Currently, Broad Institute manages more than 50 PB of data.